Today I hope to sew up some new bibs and burp cloths. I have not made any of these for over a year. Around 13 months ago, when the the vague possibility of moving to Hong Kong was early days and still just a possibility, I stopped making them. Then, rather quickly, we really were moving to Hong Kong and no more bibs or burp cloths were made as I was busy packing and sorting. Now, this week, a dear friend has had her first baby. These fabrics are so her. Yes, the pink and red strawberry fabric is getting used again. I guess you can tell I love this fabric. I don't normally share on my blog presents I am making for friends before they have received them. In this instance, I am sure she wont be reading my blog, so I should be safe. I best get sewing, I want to get them in the post as soon as possible. I can see why you love that fabric - it is gorgeous! Sewing for a new baby is a favourite thing for me! I can see why you love the strawberry fabric, it's gorgeous! I so love that straberry fabric too. I know what you mean about sharing presents on your blog before someone has received them. 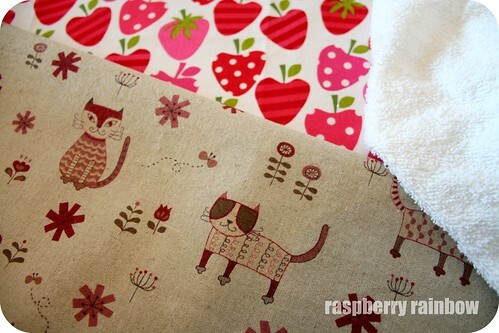 That kitty cat fabric is FAB!!! Good luck with your move to HK, I hope it all goes smoothly! Lovely fabric! I can see why you have used it more than once!